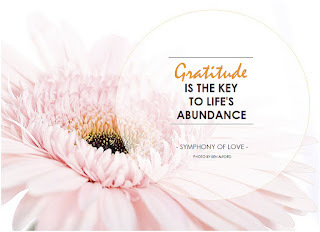 There is nothing better than starting #NaBloPoMo challenge with a gratitude list. 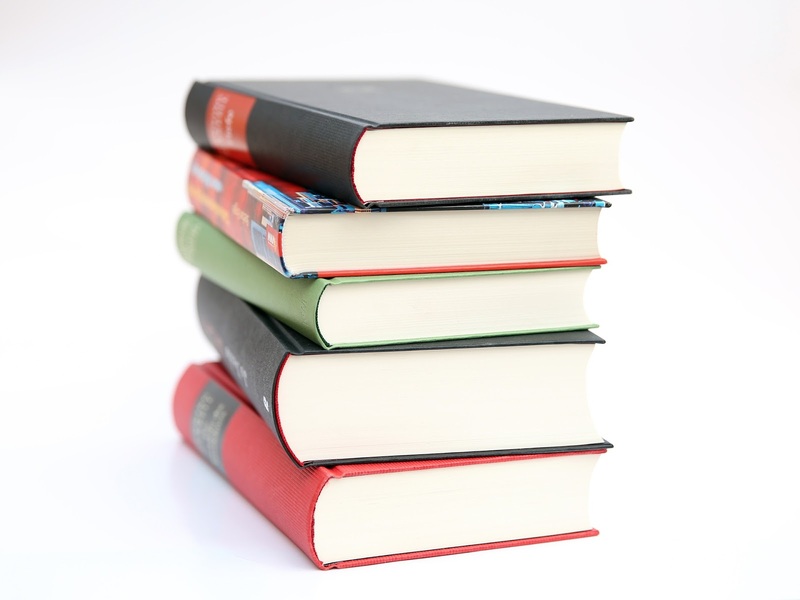 I have set a target of completing 25 books this year and I have reached my target 2 months ahead. I know, my target is not that hard to achieve but it is unpredictable managing 2 kids and I don't want to hurry reading my books but I want to read slowly and enjoy the process. From next year on, I will try to set a high target and achieve it. This year October month mark a major detour in my life. Yes, I quit the work force after 10 long years and I am taking a short break. I miss the last minute work pressure, meeting deadlines , my spirit of testing a software only to break it, coffee and tea breaks, my close colleagues, office gossip and a lot and lot. But, I am happy that the transition to stay at home mom is smooth without any emotion burden. I love mountains and cool places from childhood. At last, moved to a place which is exactly like that. I am in the process of making new friends, researching on making a small home garden, enjoying lovely evening walks and setting up our new home. I am very grateful to God for blessing us with beautiful nature which is therapeutic. October is the month of festivals. I enjoyed celebrating Dasara, Diwali and Halloween. 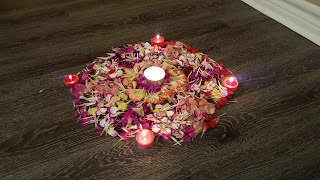 While I tried new recipes to offer to God for Dasara, I prepared some crafts for Diwali and Halloween with kids. 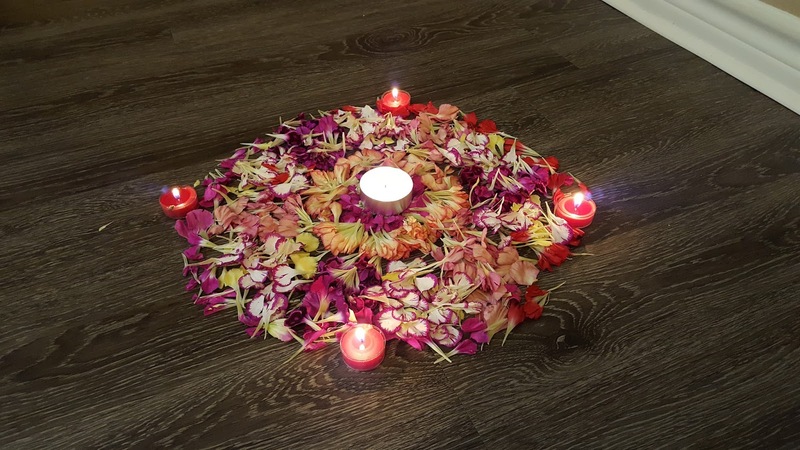 A flower rangoli and the decoration of diyas obviously lifted up our moods though away from home land. I had the opportunity of blogging more on travel, parenting, and books this October and I am very grateful for that. A few sponsored posts happened too after a break. I am looking forward to #NaBloPoMo challenge this month. So, that was the month which was great for me in this year. What are you grateful for in October? please do share your thoughts in comments or join gratitude circle by Vidya Sury. Sounds like you had a great October. As far as reading goals go, I completed my goal of 30 with 3 months to spare too, but I am glad that this way, I did not have to rush myself and rob the joy from reading. Great decision of stay at home mom. Really your gratitude list impressed me. Stay blessed. Happy November !!! Ha! You did have a great October, Ramya. I have quit my job of 5 yrs and yes, I miss those hustling and bustling. But I'm glad that I could join my husband and is having a relaxing time. 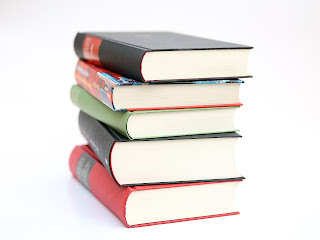 I had set a goal of 50 books and I have completed 38. More to go. Hope I will be able to achieve my target. Thats true Shanaya. We cannot rush reading books, we lose the joy if we do. Congratulations on reaching your reading goals, Mahathi! You're very brave to quit your job--enjoy the break! All the best for NaBloPoMo--I am sure you will ace it! Wishing you a happy life in your new surroundings! 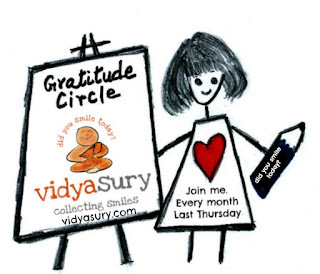 Thanks so much for joining the Gratitude Circle. Sending you love and hugs!